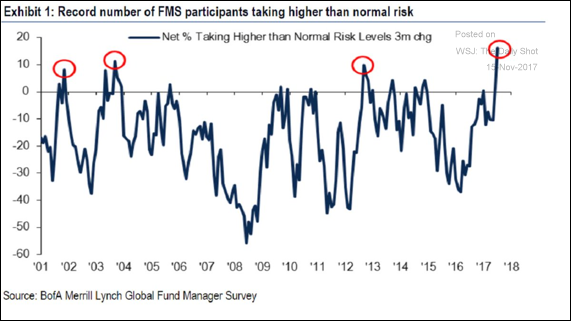 Professional managers feel pressure to increase risk in order to produce outsized returns in a one-way market that seems to go only up. There is still some steam left in this bull market, but a downturn will eventually occur when earnings are exhausted. Tech will not be immune to the downturn. The good news is that we will face a good-old fashioned correction—not a crisis—and we always come out of recessions stronger than before. It ain’t over till (or until) the fat lady sings is a colloquialism which is often used as a proverb. Based on the dramatic conclusion of an Opera, in which a plus-size female singer belts out the finales, this expression means you should not presume to know the final outcome of an event that is still in progress. 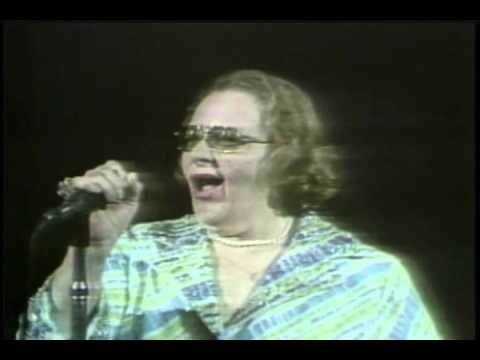 More specifically, “It’s not over until the fat lady sings” is used when a situation is (or appears to be) nearing its conclusion. It cautions against assuming that the current state of an event is irreversible and clearly determines how or when the event will end. Self-driving cars, robotics, and artificial intelligence would have anyone believe it’s the end of the world as we know it. Of course, every new technology in history promises to eliminate human jobs and cause massive disruption. But, here we are in the golden age of technology with record lows in the U.S. unemployment rate. The more things change, the more they stay the same and the business cycle is always a great example of history repeating itself. Understand this; it’s not the end of the world! Heck, it’s not even close to 1999 or 2008, but it is starting to get interesting. I have written a series of articles over the past two years explaining that we were not yet close to the top of a bubble for a host of reasons. First and foremost it was due to the lack of the usual public euphoria that ends bull markets. In my April 2017 piece, we discussed the phases of a bull market and how the “mania phase” had not even begun as money continued to pour into bonds. It also explained how you would be more likely to hear about the magic of indexing around the water cooler than get tips about Bitcoin. Well in a short seven-month span, the mania phase has begun. It’s not yet close to the velocity of past bubbles, but we are seeing evidence that animal spirits are kicking in. No worries–this is America and the animal spirit is what drives the unemployment rate to 4 percent. Let’s take another quick look at the phases of a bull market. Are we hitting “greed”, “delusion” and “new paradigm” phases? That’s not clear, but we are finally showing some signs of greed after the extremely long investment hangover that followed the 2008 financial crisis. 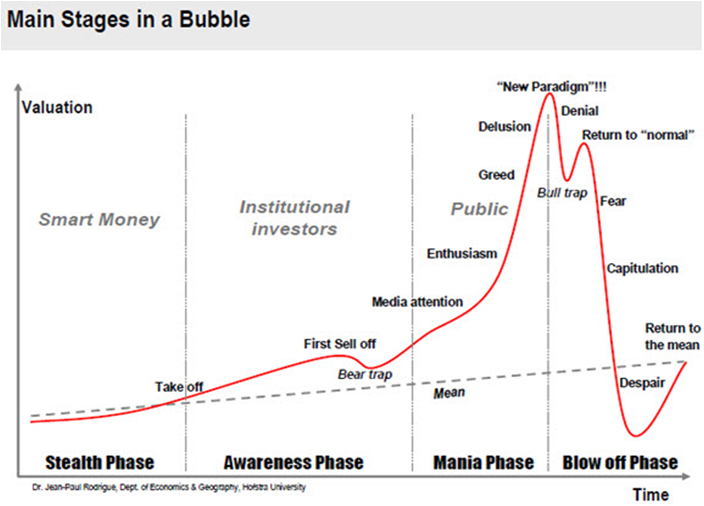 The three stages of a bull market…We are sliding up the line in the mania phase. Accumulation stage: The start of the uptrend when informed investors enter the market. Public participation phase (the longest phase): An improving economy and better earnings create more participation from the investing public. Excess Phase:When it seems-only good times ahead, the last of the buyers enter the market. In my last three articles I argued that the bull would continue. The first things I look for are: retail investors going all in, and managers going all in? Are they? Check and check. 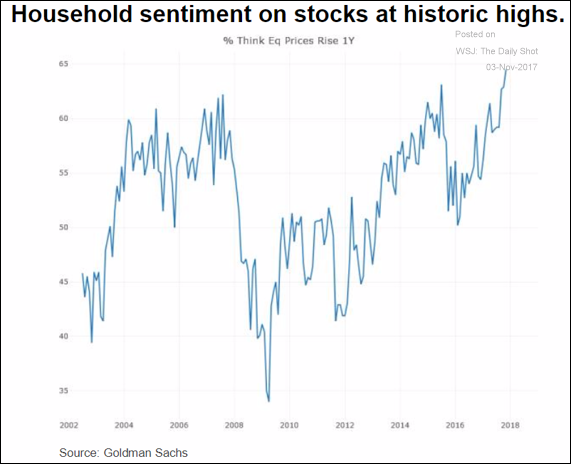 Household sentiment about the stock market is back at historic highs, but the average retail investor is not yet fully invested. Again we are close to the top, but not quite. 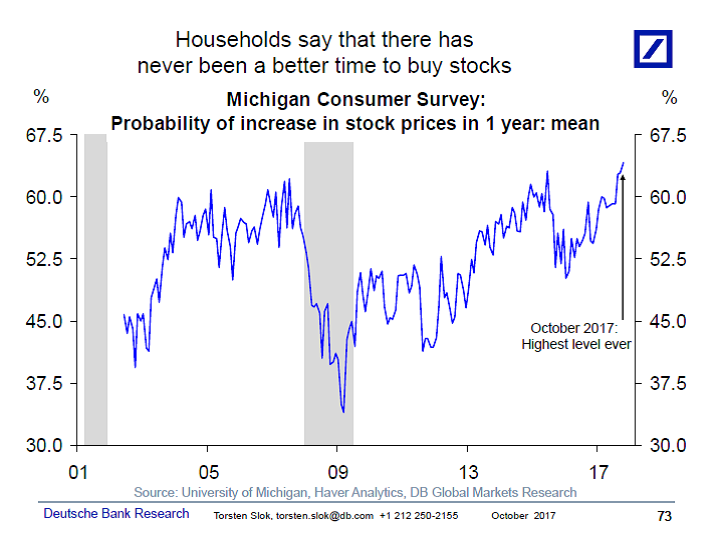 Unfortunately most retail investors are terrible stock market timers. Throughout history, they consistently buy at the top and sell at the bottom so tracking sentiment as well as dollar flows are a great contra-indicator. U.S. retail investors say that today is the best time ever to invest in the stock market (see chart below). Paradoxically, the only people who are worse market timers than retail investors are professional investors. Mutual funds are under tremendous pressure to produce quarterly returns or else lose assets. This forces them to chase benchmarks at exactly the wrong time, as equity volatility collapses and even small amounts of cash become too big of a performance drag to bear. As the mutual fund industry experiences a collapse in fees, this anxiety over cash drag produces a misguided “all-in” mentality. Fund managers now see the risk of not participating in the bull market as even greater than getting burned by staying in—even if hefty market valuations are causing severe stomach pain. 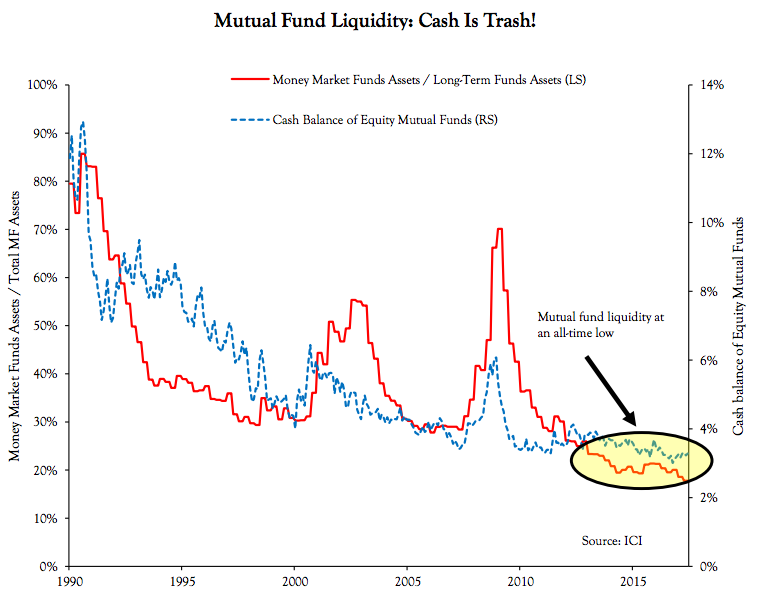 See below, mutual fund cash below 1999 and 2007. As professional managers go all in, the tension ramps up on them to increase risk as the only way to produce outsized returns in a one-way market that seems to only go up. If the S&P 500 is cranking new highs every other day, the portfolio manager elects to increase risk in order to differentiate his or her fund from benchmarks that charge .03 basis points (bps). We have now exceed the level of professional manager risk taking last seen in 2007 and 1999. Equity Markets: The Merrill Lynch Fund Manager Survey shows excessive risk-taking at levels we haven’t seen before. This is precisely the sort of thing that makes Federal Reserve officials uneasy. Historically when managers increase risk, a fresh sector or sub-sector emerges as the new world order–think Nifty-Fifty stocks of the 1960s, biotech in the 1980s and internet stocks in the 1990s. This particular run as usual is different in its own way. We have a group of four stocks called FANG (Facebook, Amazon, Netflix and Google) that is now bigger than the entire S&P energy sector. On top of the new technology side of the equation, we live in a world that is increasingly invested passively in index funds and exchange trade funds (ETFs). These passive vehicles are buying billions of dollars a day of FANG stocks with no end in sight—at least until the next recession. There is no question that FANG stocks are leaders of a new technology world order that’s built around robotics, artificial intelligence, autonomous vehicles, online shopping and learning. But, at what valuations? Every bubble ends in its own way, but what they have in common is floating higher around new theories that seem to justify higher prices. 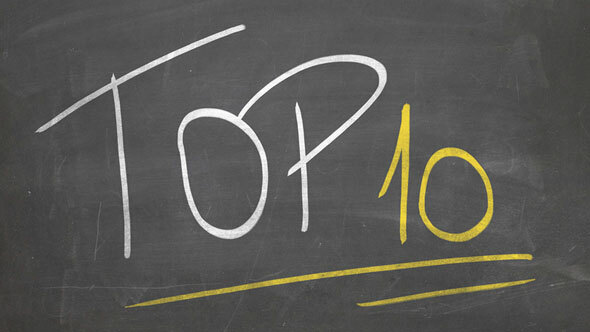 Is a small group getting its own futures market the sign of a top? FANG + Futures start trading today, based on the NYSE FANG+ index which includes 10 highly liquid stocks that represent the top innovators across today’s tech and internet/media companies. The index’s underlying composition is equally weighted across all stocks, thus providing a unique performance benchmark that allows for a more value-driven approach to investing. FANG stocks bigger than S&P energy sector. FANG stocks are certainly not pretender stocks like Pets.com or Webvan that we had in the dot-com crash of 2000, but like most of life, tech earnings are indeed cyclical. The broad economy moves in cycles. Periods of peak performance are followed by a downturn, then a trough of low activity. As the cycle turns downward, risk happens faster due to proliferation of ETFs that make it easier to trade in and out of indexes, especially in expensive sectors and sub-sectors. 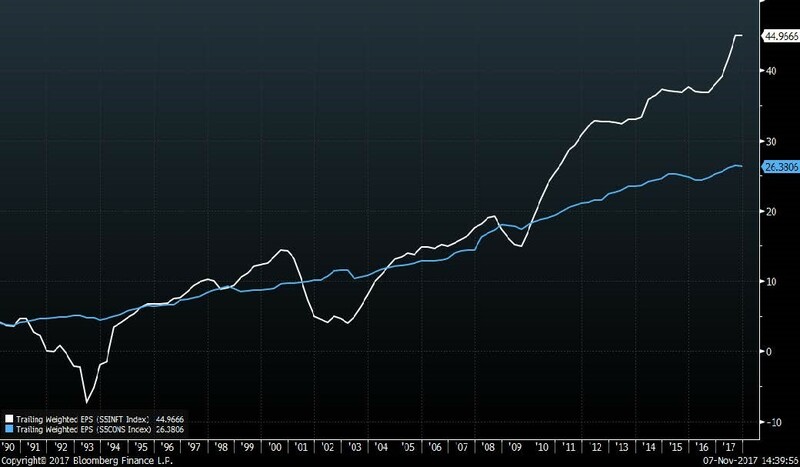 The chart below compares the long-term earnings stream of the S&P 500® Information Technology sector (white line) with that of the S&P 500® Consumer Staples sector (blue line). At the peak of a cycle (like today?) the Technology sector looks to be superior to Consumer Staples. However, the Technology sector’s growth quickly loses momentum during profits recessions. Tech looks to be a superior grower compared to Consumer Staples only toward the peak of a cycle. 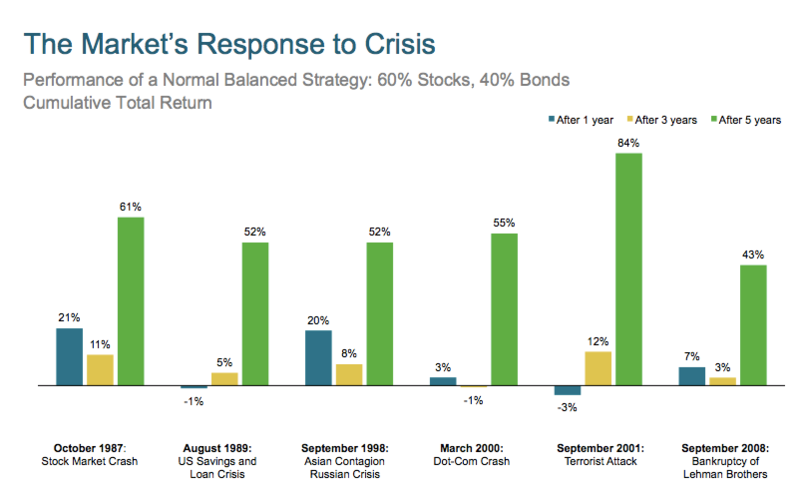 Richard Bernstein of Richard Bernstein Advisors has more about this trend. 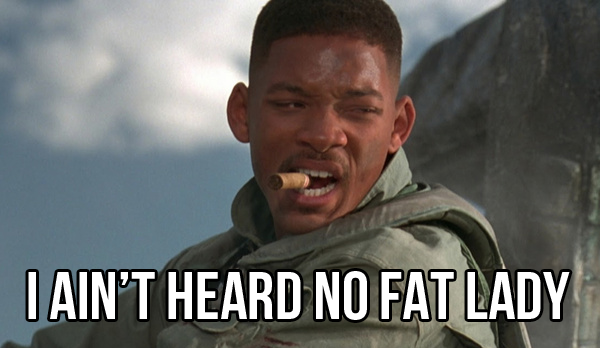 At Fortis, we see no clear signs of a recession yet. As long as earnings keep rising, the cycle will continue, but eventually it will be exhausted and a downturn will ensue. Tech is not immune to that slump as the 27-year chart (above) shows. Greed and rampant speculation are as American as apple pie. More money has been raised in completely unregulated initial coin offerings so far this year than the global IPO market. I am not an expert on crypto- currencies, but it is safe to say that animal spirits are flowing when an unregulated market goes up 900 percent in one year with a 30-percent correction per quarter. At the beginning of 2015, Bitcoin was trading just above $300. In early November of this year, the Bitcoin price topped $7,600. That translates to returns north of 2,200-percent in just 1,041 trading days. By comparison, the NASDAQ index was up 391-percent after 1,041 trading days from the start of 1995. Returns on the NASDAQ index at the time peaked just shy of 1,100-percent after 1,326 trading days. 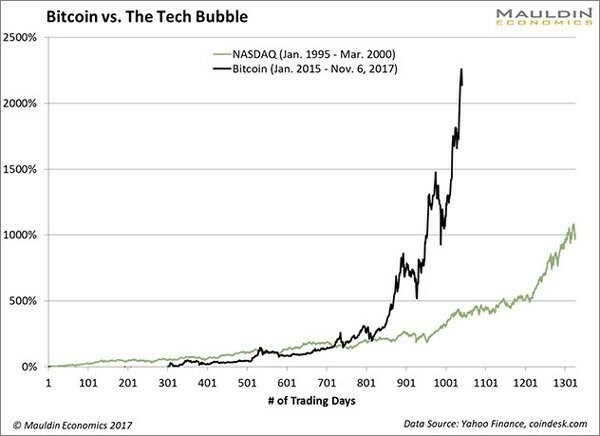 Bitcoin’s run has far outpaced the tech bubble, and its returns have already dwarfed the dot-com mania. Fortis is not in the game of predicting future outcomes, but bitcoin is the most vivid investment example of the mania phase beginning, 2200% move in 1000 trading days and everyone I know is asking me about bitcoin. 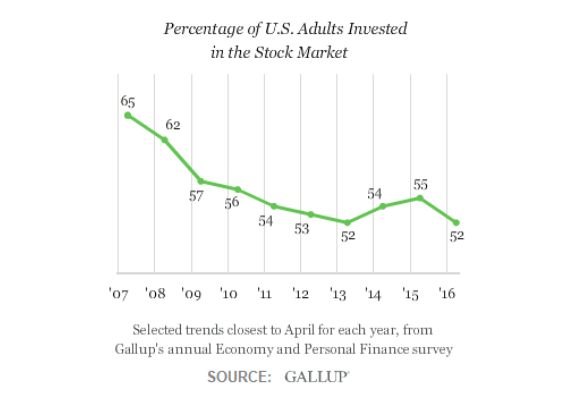 The American population is just starting to embrace this bull market and equity exposure has not hit previous highs of 60 to 65-percent. This may be partly due to Boomers hitting retirement and electing for more conservative portfolios than they had during their working years. But, a more likely explanation is that a fair number of citizens still need to throw in the towel before the next correction or recession. To be clear, I am not expecting anything like the 2008 financial crisis or even the 1999 tech bubble. The next setback will be a good old fashion recession. 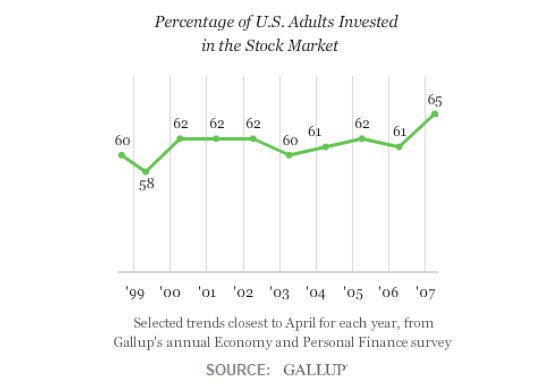 The good news is that America always comes out of the recessions in dramatic fashion. The even better news is that we have demographics on our side this time around. We are about to embark on a massive Millennial household formation cycle that will lead us back to prosperity no matter what kinds of short-term setbacks we encounter. Bull markets usually last 10 to 15 years and this one is only five to seven years old, but we have some corrections to face in the meantime. After a 15-year decline of 35 to 44 year olds in the U.S., we are about to see a massive surge that will make up a significant share of household formation that could top 48 million by 2030. Younger families will buy homes, have children, invest and consume. As I wrote in previous articles, the S&P 500 has had 12 corrections of at least 20-percent in the last 70 years and the market is up 15,000 percent during that time frame. The cycle will repeat itself as it always does, but we will start a new cycle led by positive demographics and a new technology revolution. It’s the end of the world as we know it, but the economy and markets will remain cyclical. Matthew Topley is the Chief Investment Officer of Fortis Wealth, 1045 First Avenue, King of Prussia, PA 19406 (610) 313-0910 mtopley@fortis-wealth.com and author of the View from the Top blog.